A team of geoscientists from Edinburgh University is monitoring an erupting volcano in the Galápagos Islands to study how earthquakes affect volcanoes. In Dr Andrew Bell's office at Edinburgh's School of Geosciences, we can hear the Earth move. First there's a low boom, then a shorter click. Sped up 100 times to bring them within the range of human hearing, these are the waves created by an earthquake. To be accurate, two earthquakes. The short metallic click was a seismic event - a mini-quake - at the Sierra Negra volcano in the Galápagos archipelago far off the coast of Ecuador in the Pacific Ocean. The deep boom that preceded it was an earthquake almost 2,000 kilometres away in Honduras. The big quake far away triggered the smaller one close by. That's what interests Dr Bell. He is both a seismologist and a volcanologist and this research combines both disciplines. His screen displays traces of the seismic activity happening around the volcano. It has a caldera - a crater created by a collapsed magma dome - six miles (10km) in diameter. The whole volcano is more than 30 miles (50km) across and just under a mile (1.6km) high. "We've deployed a network of seismometers. We've got 14 instruments there," Dr Bell says. "They'll allow us to locate where the earthquakes are in the volcano and provide us with a really great dataset to study in the years to come." "What we're seeing at Sierra Negra are large earthquakes from Mexico and Honduras ... passing through the volcano and triggering lots of small earthquakes in the volcano." The interactions are providing data for computer models they are building of more populous earthquake zones like Italy. Preventing quakes and eruptions may be beyond the power of humanity but a better forecasting system could save lives. That is why the project is funded by the UK's Natural Environment Research Council. 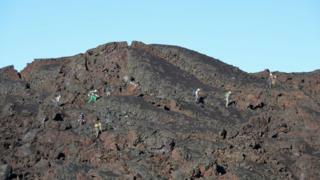 Dr Bell and his colleagues set up their sensor array in the hope they could measure an eruption in progress. Within the past few days, Sierra Negra has obliged. About 50 local people have been evacuated from the area and tourists warned to stay away. For the geoscientists, the islands have become a "living laboratory" in much the same way as they have been for evolutionary researchers. The islands are home to many other forms of unique wildlife including the famously long-lived Galápagos tortoises, turtles, seals, penguins and two types of iguana. While conservationists may worry about the effect an eruption may have on them, a geoscientist would point out that without volcanoes there wouldn't be any islands in the first place.